If you are a member of BAMA, you should be able to post a job here. Please include the city in parenthesis. If not, email the job description along with complete contact info to BAMA. Please include any preferred certifications for the job. If not a member of BAMA, please consider joining - here is a link to our application. 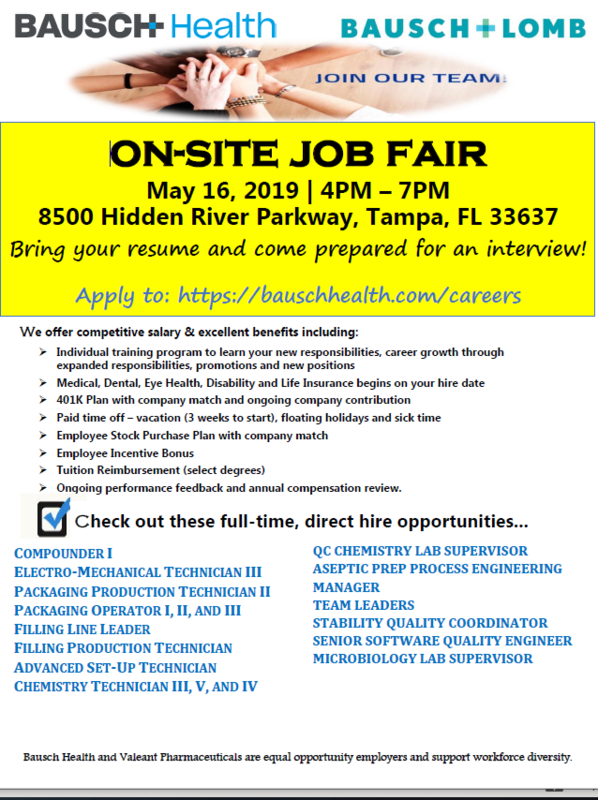 Job Seekers - please pay attention to the date posted as some jobs may be old and closed. 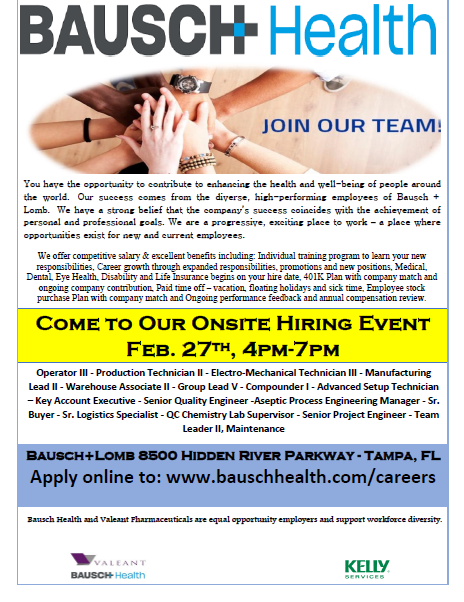 The purpose of this position is to lead and manage product transfers for internal and external opportunities at Bausch & Lomb Tampa. This includes management and maintenance of existing external customers, new manufacturing business opportunities, as well as internally developed product transfers. This position provides quotes to customers for all project requests and also manages the supply agreement approval and renewal process. This position is also responsible for the process engineering / validation of new and improved capital equipment. Management of Process Engineers to support project activities and site goals. Employee development, training, performance reviews, etc. Manage internal and external technology transfers and maintenance of business projects. Major technology transfer projects are planned for and executed over a period of 2-3 years. Manage process engineering (engineering studies, process development, PV's, CV's) for new and improved capital equipment. Lead recurring conference calls with customers and issue meeting minutes as needed. Lead cross functional teams for investigations as required. Provides a leading role for the Tampa site and collaboratively works with other support groups in the MRB process to assess, recommend and implement technical resolutions to investigations, non-conformances, and OOSs/OOTs. Provide quotes and manages project budgets for new and existing customers for all project requests. Facilitate the negotiation of new and renewed supply agreements between B&L Tampa / B&L Legal / External Customer. Works with the broader Engineering team to recommend and implement manufacturing equipment changes when necessary. Works with the Validation and Quality groups to implement improvements to the product requalification subsystems. Reviews and approves documentation (Quality by Design, Process Validation, etc.) related to process capability of new products to assure they are developed with robust manufacturing capability. Ensures project compliance to all local, state and federal regulations. Supports department goals and Business Operational initiatives. All other duties as assigned. BS or MS in Chemical Engineering related engineering, or physical science degree. Previous experience with technical transfers required. Strong technical skills in a cGMP environment. Project management skills (PMI certification a plus), application of time management, and ability to manage budgets and supply agreements. Solid understanding of compounding, filling, and packaging manufacturing processes with focus on non-sterile and sterile solutions, suspensions, and ointments. Be detail oriented, quality conscious, and customer service oriented. Responsible to source, procure and inventory plan for direct materials and/or indirect materials and services necessary for the production of products in accordance with company policy, specifications and cGMP's. Manage supplier relationships to drive improvements in quality, total cost of acquisition and support new product development. Must be versed in subject matter for given commodities and/or services. Negotiate Supply and/or Service Agreements. Issue Purchase Orders as needed for identified goods and services to support the site. Participate and/or lead multi-disciplined teams to develop and implement sourcing strategies and tactics. Assume responsibility for the GMP, environmental health and safety procedure awareness and compliance in the respective area. - Source and Procure direct, indirect and capital materials and services to support the manufacturing plan and site operations. - Implement sourcing strategies to manage critical commodities with emphasis on reducing costs, improving efficiencies and helping to assure supply chain continuity. - Manage relationships with key suppliers and develop partnerships that improve overall efficiencies, quality and performance. - Develop and maintain expertise for given commodities and industries inclusive of cost drivers, supply constraints and supplier base. - Monitors, measure and report supplier performance in the areas of quality and delivery. - Manage & monitor open orders to assure on-time deliveries in support of the production plan. - Implement inventory plan and investment in specific commodities. - This position is based primarily on API sourcing/procurement. Minimum of 5 years sourcing/procurement experience. Ability to prioritize multiple tasks and projects with limited direct supervision. Effective organization and negotiation skills. Strong ability to follow up on and complete projects. Basic understanding of computers. Daily activities include support of utilities, facility, HVAC, and outside contracts that include: Pest Control, Security, landscaping, cafeteria services and site services; overall operation of the utility equipment. Assure that Facility/Utility related work orders, PM’s, critical system work orders are executed and completed. Oversee the passivation, preventative maintenance, shutdowns, department metrics, and training programs for department associates. Support Reliability Program. Support the Facility Review Board (FRB) process. Leads and ensures on time completion of compliance investigations, non-conformances, deviations, CAPAs, and work orders. Facility and Utility departments and oversee operation, installation, and maintenance of related equipment. Respond to emergencies 24/7, work with the hurricane preparedness team and Coordinate Security services during facility emergencies. Assist validation on protocols, revalidation, review and sign-off. Assist on validation on protocols related to Utility department. Participating in inspections conducted by internal and external regulators and contract customers. Ensures compliance with EHS&S and OSHA requirements. Assist FM Global and EHS on liability and risk assessments. Support projects as needed, including document review, vendor negotiations, etc. Work with various state and local agencies, FDA, ETA, etc. Communicate with contractors on projects, contract negotiations, scheduling and compliance with company policies. Support activities for outside contractors for Site services, Security, landscaping, pest control, and cafeteria service to ensure they stay compliant with site and contract. Support the site reliability program. Support requests for computerized security system, as well as digital media, cameras, and intrusion systems. Support activities for utility, facility, HVAC, site, security, landscaping, pest control, cafeteria services, overall operation of the utility and facility equipment. Assure that facility, utility related work orders, PM’s, critical system work orders are executed and completed. BA Degree in Mechanical Engineering, Business or Maintenance related field. Background in Maintenance Reliability a plus. Logical approach to problem solving. Good organizational skills, able to work quickly and under pressure. Good verbal and written communication skills. Must be detailed and safety oriented and quality conscious. Project Management and leadership abilities. Computer skills with Microsoft Office a plus, and various tools. Utility computer monitoring systems, such as a BAS, EMS or BMS systems. 5-10 years maintenance/utilities experience. Position includes responsibility over associates to provide assistance withtroubleshooting industrial process equipment. Pharmaceutical or food industry experience a plus. To provide leadership in the Compounding Department for all personnel to ensure that quality products are manufactured to meet the production plan. Place customer service and accountability to the customer as the constant goal. Coordinate closely with other departments on operational and planning issues related to meeting the production plans and company goals. Assume responsibility for the GMP, environmental health and safety procedure awareness and compliance within the respective area. Supervise, develop, provide feedback and coach employees. Complete performance reviews semi-annually. Review weekly production schedule and work with the Planning department on capacity and scheduling issues. Coordinate activities to support the production schedule. Participate in process related issues using thorough technical process knowledge. Perform investigations and write reports as required. Review, approve, write and revise SOP's and other documentation. Participate and lead in Operational Excellence projects and attend GMP training sessions as required. Train/re-train department personnel on safety, cGMPs and SOPs as needed. Work with Tech Services, R&D and Contract Manufacturing on the transfer of new products & engineering studies. Perform audits of area on scheduled basis for compliance to procedures. Asset and supply management. Generate required WOs and POs. Operate department within budget guidelines. Review standards annually for necessary revisions. Manage proper Inventory levels and supply flow for assigned commodities, activity requires close working relationship with procurement, shop floor planning and quality. Provide overall obsolescence analysis on monthly basis. Provide ERP system maintenance activities. 1. Inventory analysis and requisitioning to procurement for assigned commodities insuring material availability while minimizing inventory and obsolescence exposure. 2. Insure material receipts are processed and released in a timely fashion to support manufacturing needs. 3. Works closely with shop floor planning and incoming quality inspection. 5. Supports commodity material changes to specification and material/supplier transitions. 6. Responsibility for overall obsolescence planning and management on monthly basis. Forecasting potential obsolescence for future periods. This role will have planning responsibilities managing internal customer needs against supply capabilities insuring a high level of customer service while staying within inventory targeted ranges. Will work closely with finance for management of obsolescence. This position will work closing with shop floor planning and Quality expediting materials as needed. BS in Logistics, Business or Management Sciences, Excellent communication skills throughout all levels of the organization. Detail oriented with very good organizational skills. Computerized MRP systems, MS office products with emphasis on Excel. Some knowledge of change control management. 5-10 years of supply chain experience in pharmaceuticals or other process related industry. Valeant Pharmaceuticals International, Inc. is a diverse pharmaceutical company that is committed to focusing on our key stakeholders while delivering consistently high performance. Our values provide the overall direction for our company, and provide us with the tools necessary to rise to any challenge by leveraging our collective hard work and effort along with our unwavering competitive spirit. These values help us set goals based on our organization’s potential and what we hope it will become. The Manager of Aseptic Process Engineering is responsible for leadership of the engineering competency for US Pharmaceutical manufacturing and executing projects that align with the product strategy and site priorities to drive process and quality improvements, cost reduction, and ensure continuity of supply. US Engineering technical manager for the Aseptic Process Engineering Team in support manufacturing process improvement, capacity scale-up, sustaining engineering and maintenance of business, and strategic programs. Influential leader responsible for technical direction of the team and ownership of the aseptic process technical competency. May manage project portfolios and or individual Sustaining Engineering and/or MOB projects. Interfaces with multiple internal organizations and external suppliers in leading and executing projects and or strategic business initiatives. Provides direction and oversight to Aseptic Process technical team. Supervision of 4 full time employees and 3 contract engineers. Leadership of the Aseptic Process Engineering competency and associated resources in the US Pharmaceutical plant including functional management of the group, budget, planning, and projects associated with design, development, technology transfer and production. Develop and execute an engineering strategy for the US pharmaceutical plant based on industry standards and best practices ensuring regulatory compliance through the selection and implementation of the latest technology in facility design, processing equipment and methodologies. Ensure that engineering knowledge, processes and best practices are leveraged across sites and drive manufacturing platform standardization where appropriate. Provide leadership, guidance and support in technology transfers, new product launches, troubleshooting and problem resolution, capital project planning and executions, cost improvement and talent management. Manage a portfolio of Sustaining Engineering Projects aligned with site priorities to drive process and quality improvements, reduce cost, and ensure continuity of supply. Provide oversight and direction to the Pharma Maintenance of Business Portfolio Leader and support MOB projects, activities, and resource plans. Tampa Manufacturing Site Leadership Team. BS/MS Mechanical Engineering, Chemical Engineering, Materials Science. Experience with facility and equipment start-up and manufacturing in sterile cGMP pharmaceutical operations. Strong background with Sterile GMP guidelines, EU standards. Engineering management and technical staff development. Leadership of large-scale manufacturing improvement programs/projects. Familiarity with FDA regulated products. Strong troubleshooting and analytical capabilities with experience in DOE. GMP, Six sigma, DOE, and Design for Manufacturing. Strong communication and interactive skills, capable of leading and directing project teams as required. Understanding Regulatory requirements for ANDA and NDA product and process changes. Product and process development phase/gate methodology and manufacturing tech transfer. Interfacing and communicating with site and corporate leadership.